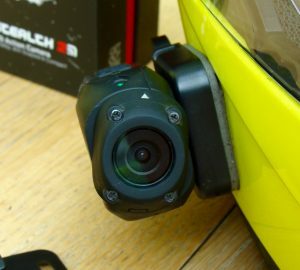 The Drift Stealth 2 is definitely larger than my old Road Hawk RIDE bullet camera, but does feature more buttons and a screen to indicate what it’s doing. A considering how much more it does, these are essential. The Road Hawk was really a one click – one function camera, whereas the Drift lets you shoot in many different modes and has far more configuration settings to play with – no comparison really. The helmet mount is straight forward enough, a sticky back pad goes on your lid, then a rotatable mount screws onto back to the camera and slides into the helmet mount. 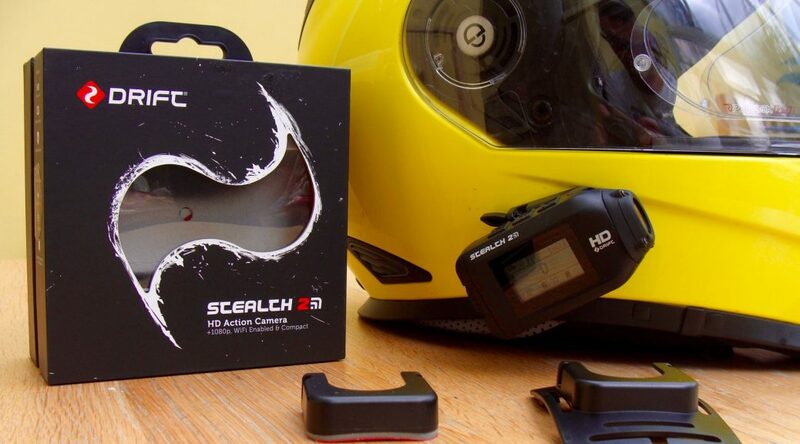 I like this setup as when riding with no camera, you only have a slimline pad stuck to your helmet. With camera in place, it’s still fairly aerodynamic and no noticeable drag until you hit illegal speeds. The camera lens can be rotated to find tune alignment, really quite nifty. But the lens and mount only offer rotation in two axis, so some thought into mounting position is still needed, unlike the Road Hawk which had a ball joint mount to angle in any direction. 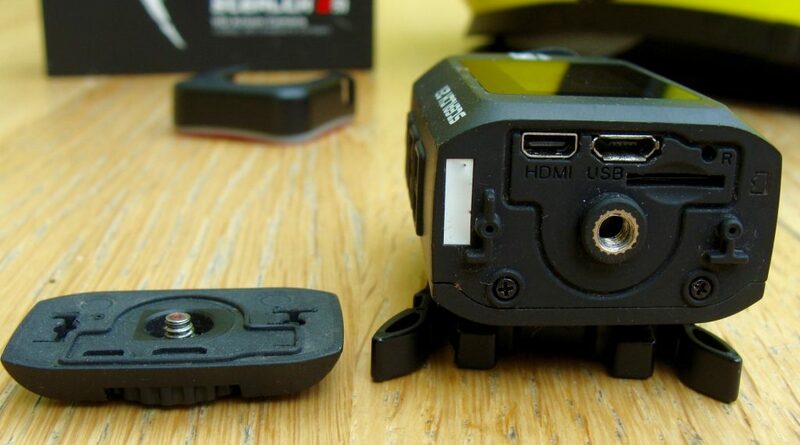 When the battery is flat, I mount the camera under the fairing of my bike and run off a USB socket I’ve fitted. The swivelling lens is great in this setup allowing for the camera to be mounted any way up. However the Stealth 2 can only be plugged in when the water proofing back cover is removed, so not an option in wet weather. Also, the recorded footage has quite a bit of vibration induced ripple from the fairing, but still plenty good enough for an insurance claim. Operating the camera with gloves on is fine, though turning it on needs first a long press of one button, then waiting several seconds to boot up, then another press of record button to start off. 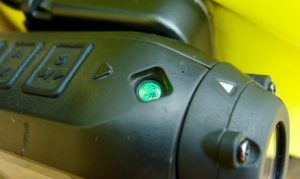 Doable with gloves on when attached to your helmet, but it is easy to inadvertently press the wrong button and toggle to a lower quality recording mode. In some ways I prefer the more tactile button sticking up on the Road Hawk. I almost always shoot at 1080p @ 30fps, and find the results very reasonable. 60fps is an option, but only at 720p. It records MP4 files in 5 min chunks (configurable) at about 650MB each for 1080p, so with a 32GB SD card (max supported), that’s approx 4 hours footage. Usefully the recorded MP4 files are playable in Quicktime straight off and need no converting first (unlike Road Hawk). Battery life is around 2.5 hours which is pretty impressive. It is however fussy on the charger and will only charge properly with a 2 amp USB charger (not provided). Reliability hasn’t been too bad, but not without incident. The initial one I purchased had the LED light cover loose in box. The second refused to charge after 9 months, Drift Innovation wanted lots of info for a warranty claim, but in the end did nothing and told me to go back to PC World who then took weeks to get a replacement in… The third is holding up fine so far, but the LED cover has come off. There has also been the odd occasion where it has locked up, needing a reset; or just decided to stop recording for no apparent reason. Possibly related to overheating on very hot days, but hard to say for sure. Overall, the Stealth 2 has held up pretty well, more than enough for some insurance claim evidence and fine to get you started on some VBlogging. Prices have come down a bit and you should be able to pick it up for about £100, making it very good value. I had the same problem with the charging. After only 6 months of light use in the car as a dashcam on weekends only and it stopped working. Staff at Drift just said “there’s a chance your camera might have simply come to the end of its life.” and didn’t want anything to else to do with it. Expensive piece of kit for only light use. Bought one second hand on eBay. Worked fine for a few weeks, then got error message saying: Battery too low! and it would turn itself off. This has continued to do so despite repeated 10-12 hour charges. 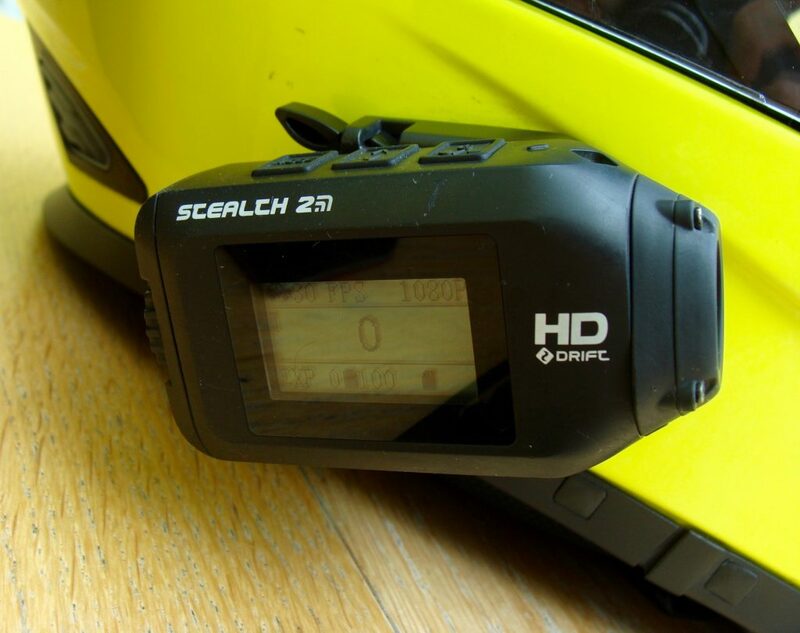 A look around the web tells me that once the Drift 2 battery dies it’s game over because it isn’t meant to be replaced. Bit of a kick in the teeth when they’re £130 brand new. A further search revealed a YouTube video where a guy bought a cheap replacement battery from China and replaced it himself, however it did require soldering so if you’ve got a soldering iron or know a friend/workshop prepared to give it a try it might be worth a shot. Wait a minute! What USB charger did you use? The Drift is a bit fussy if it doesn’t kick out a good 2 amps of current. A lot of chargers and USB sockets on PC’s etc sometimes only output 0.5 amps (this was min as per USB standard when first introduced). So double check your charger and/or try it with another good quality one that can supply a decent charge.